No need to get someone to open your conatiner for you. All containers have 24hr CCTV surveillance. Your own designated storage container. Need more space? Get household and domestic storage according to your needs. Get in touch with us for commercial storage space. We cater for all types of business. Have less and less space? Need to store office items like documents, files, archiving and stock? Need A Hand Moving Your Items? Need help while moving items? We have an affordable solution to fulfill your needs. 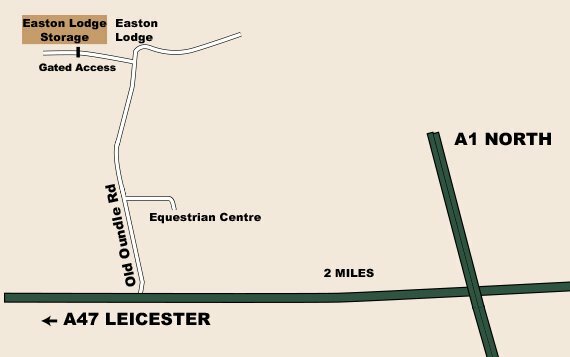 Easton Lodge offers a high quality storage site with state of the art security. Located in Wittering and serving Stamford, Peterborough, Oakham and surrounding areas, our units are easily accessible and available in a variety of sizes – all at competitive rates. Our aim is to provide customers with a cost effective, flexible self storage solution with comprehensive safety and security. Are you from Wittering, Stamford or Peterborough areas and looking to store your items whilst you move house or have you out grown your space? Perhaps you need long term storage because you don’t have a shed or garage? Our dry, clean, secure and well maintain storage units ensure your items are safe and secure at all times. We are local storage solution providers who go that extra mile to accommodate your needs. Our team can show you the best way to store your goods and utilise the space provided. If your office or store is overflowing with stock, tools, machinery or archive documents, let us assist you with your storage needs across Stamford, Oakham, Wittering and Peterborough. Moving house? Need to store excess furniture and household items? Is your loft space full to capacity? Or you need to just free up much needed space in the home. Your non-essential items can be stored in one of our dry containers. You can also store your sports equipment. With easy access to your storage container, you will be able to retrieve items whenever you need them. Located in Wittering, with great access to Wansford, Stamford, Oakham and Peterborough. Q1: What size are your storage units & how much they cost? Q2: What can I store? Ans: No controlled substances or dangerous materials, otherwise you can store everything that fits in our containers. Most customers use our facility for Archive Storage, Computer Storage, Document storage, domestic & commercial storage, stock storage, etc. We needed somewhere to temporarily store some of our furniture whilst me moved house. We have found Easton Lodge Storage to be very helpful as well as a great price.